The Tennessee Society of the Daughters of the American Revolution will convene their 114th State Conference at the Franklin Marriott Cool Springs Conference Center April 25-28. Chief John Ross Chapter members will be in attendance as member Sarah Roach assumes a new position as registrar for the state society. Ms. Roach joined the National Society Daughters of the American Revolution in 1977 and, in the subsequent years, she has proven her direct descent from 25 patriots who either served in the American Revolution or rendered support to the revolutionary cause. 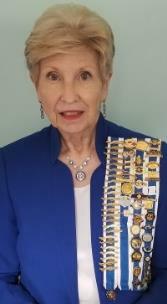 Ms. Roach, a retired Tennessee Valley Authority executive, has served the Chief John Ross Chapter as regent, registrar, first vice regent and historian, in addition to chairing numerous chapter committees and chairing the Chattanooga Area Regents Council. She currently serves the Tennessee Society as the chairman, TSDAR Master Report and State Publications while having previously having served as chairman of the State Regent’s Project Book, Lineage Research and Chapter Development and Revitalization Committees. Ms. Roach served NSDAR as the National vice chair, Lineage Research, Minority and Ethnic Research. Chief John Ross Chapter members have actively served the state society throughout its almost 100-year history with members Luanne Hobbs Dewitt, WandaLynn Poteet Garrett and Linda Moss Mines having served on the TSDAR Board during the three most recent administrations. The Tennessee Society Daughters of the American Revolution’s state conference consists of workshops, business sessions, committee meetings, social functions, and awards presentations. Special guest Denise Doring Van Buren, first vice president general of the National Society of the DAR, will give the keynote speech at the Friday evening opening night dinner. The featured speaker for the Saturday evening Chapter Regents’ Banquet will be Brad Akard, director of Development at Cheekwood. Honored guests will include the state regents of Mississippi, New York, Vermont, and Virginia and workshops will feature Historic Preservation in Tennessee, Native Tennessee Plants, and Genetic Genealogy. For more information regarding membership in the Chief John Ross Chapter, NSDAR and for assistance in documenting your family’s revolutionary genealogy, contact localhistorycounts@gmail.com.